In 2006, The Passport traveled to 20 countries on 5 continents in a span of 90 days. Utilizing pre-established contacts within each country, The Passport team (Daniel Homrich & Jonathan Fambrough) stayed 3-5 days in each location. Through digital media they captured the sights, sounds, and color of individuals and organizations helping the poor, anguished and hurting. Whether trekking the mountains of Nepal or the jungles of Costa Rica, their lens allows the visitor to meet the people on the ground, and to enter their culture, their lives, and their hearts. 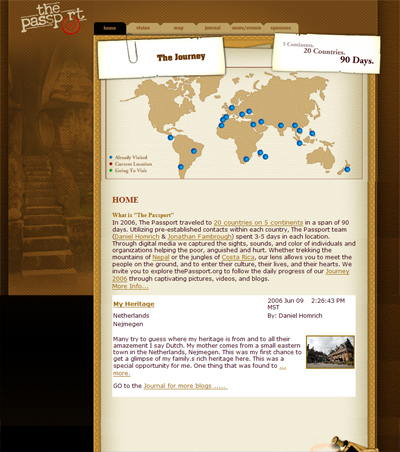 Visit www.thePassport.org to follow the daily progress of their journey through captivating pictures, videos, and blogs. Now that they have returned from our travels, The Passport is developing training materials and communication resources for each organization and individual we visited. These resources will be used for connecting new and existing supporters to the organization&apos;s accomplishments and financial needs. By empowering nonprofit organizations and individuals to tell their story, they hope to facilitate their continued growth and sustainability. Provide pre-trip infomation to investors/donors. Then provide a daily real-time web experience of the round the world trip. The Passport team would need to be able to tell their story as they traveled. This would require the web site to have a control panel for them to login and upload their stories, photos, and movies. Their Internet access would be anything from an Internet Cafe in an international city, to a portable satellite modem. Whatever the means, the team needed to tools to get their stories and pictures on the web site with ease often using bandwidth restricted Internet connections. XI Interactive created a database driven web site for The Passport. This database housed demographic information for all of the countries on the trip, the almost daily web blogs, and the movies and photos of each destination. The control panel supplied a simple forms driven interface to enter data quickly and to upload the multimedia. The Passport&apos;s trip was very successful. Using the web site as their mass communication tool, they were able to live the story in progress in front of thousands of site visitors around the world.